Welcome Fabricworm (and a giveaway)! I would like to welcome Fabricworm as my newest sponsor. Fabricworm is one of my favorite shops because they have so many fun modern collections, lots of organic fabrics, and great sales. When I first started getting really into quilting (and consequently really into fabric!) I fell in love with the custom bundles that Fabricworm offers. They are so fresh and fun and a great way to start experimenting with mixing fabrics from different collections. I also love that they offer a variety of types of fabric including minky, double gauze, flannel, and wide width options. And the coming soon section is very exciting. 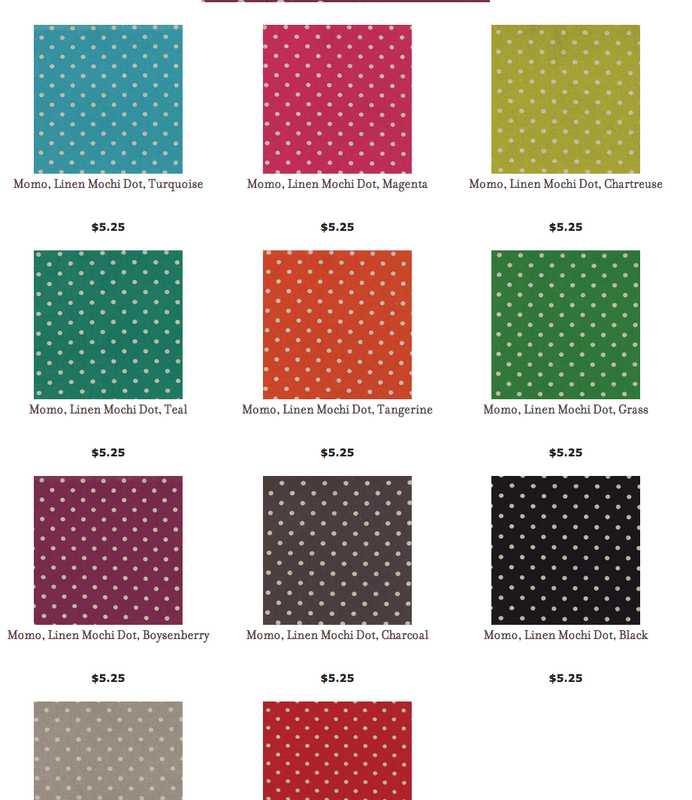 I am really looking forward to these linen dots from Momo. Fabricworm has generously offered a fat quarter bundle of Ipanema to giveaway today. This collection has some really cute prints and I am particularly excited about this yellow triangle print. To enter the giveaway, just leave me a comment letting me know what you would make with your Ipanema fabric. A quilt? A bag? Something else? Thanks for stopping by! I will pick a winner on Monday night. Make sure to check out Fabricworm on Facebook or on the Fabricworm blog. The giveaway is now closed, thanks to everyone who entered! Probably some patchwork tote bags. Thanks for the chance! You are right...that triangle print is a good one, although my preferance is the aqua...but must say I LOVE that hippy van! I think this would be a great picnic quilt/blanket. I've been eyeing this line! I'd make a baby quilt. No idea what I'd make--probably split it up to make bags, quilts, etc. I love the prints, but think they'd pair better with some quieter fabrics and solids. I just love love love this bundle. I'd probably use it to make a quilt for myself! I would use this to make a quilt for my brother -- as a musician, he LOVES guitars. I would make a large tote bag. It's such fun fabric! A quilt for my son! Great fabrics- I think they would make a great quilt! Congrats on the new sponsor! Those are great fabrics, I love the triangles as well. I think I would put together some tote bags and a mini quilt. I think it would make a great weekender bag! I love Fabricworm, too! I would use those fabrics to make a baby quilt for my friends who are expecting baby #3. Congratulations on your new sponsor, Erica! I love those linen dots too, and may have to break my fabric fast! Beautiful fabric for the giveaway, and I would start with a new tote. Thanks for the chance. Fabricworm is amazing!!! If I won this bundle I would most definitely make a quilt. Thanks for the chance! A quilt! Thanks for the chance! they would make the cutest bags!! Definitely a quilt, the fabrics are adorable! What great colors! I would make a quilt for my daughter. Love the prints so I would keep them big! Maybe some tote bags or even a quilt if the pattern was right. Thanks for the chance. A quilt for sure - I would love to mix that up with some of the fabric in my stash! These fabrics are sew cute and I can see some different sized bags made from it. Thanks for the great giveaway. I've been wanting to make some reading pillows for my son and nephews for the car ride to the beach. These would be perfect for that! It would make wonderful bags....and you can never have too many! I would make a quilt for my daughter-in-law. She loves these colours and her 30th birthday is coming up this summer and my plan is to make her a quilt. A perfect plan! A quilt for sure! And I agree, they have awesome bundles!! Some cute pillows for the cottage! Thank you! Most likely a quilt! No surprise there. Thanks much for the giveaway. I love the muted, earthy colors in this collection. I would make a cute baby boy quilt! Fun fabrics - I'd make some accent pillows. Thanks. These would make some great zippy pouches. Thanks! Oh, I would make some patchwork pillows. Lovely bundle. Thank you for the chance! Love the dots for some pillows! omg, i love this collection, reminds me of my hippie days (lol). not sure what i would make, probably add some solids for a quilt, but whatever it is, the girl from ipanema would say cool. I have wanted to make a colorful apron for some time now, and this fabric would be so cute! Probably a lap quilt. Though I can see a cute bag for the market also! I think these fabrics would be great for a quilt. Thanks for the giveaway. I'm sure these would find their way into a quilt ; ) Thank you! This is my fave line right now! I'd make a quilt. So cute. I would like to make a bag. A large one with zipper pockets and storage. Using the quilt as you go technique would be fun too. wow this line is so modern:) would love to make a dress for my girl! :) thank you for this great giveaway!! Oh, I love that fabric! I've been wanting to make the quilt "puddle jumping" by Camille Roskelley. This fabric would be perfect! Thanks for the giveaway! Oh I would definitely be making a quilt--prob. lap size to cuddle with. :) Lovely giveaway! My goal this year is to make quilts for all my family, so a quilt is a safe bet! I would make a quilt for my son. THanks for the chance. Nesting storage bowls for me! I really need to tidy up my entrance way and this would do the job nicely! I'm thinking I might start with an iPad case. I've been wanting to make one and I think this fabric would be great. My cousin is having her first baby, so i would make a baby quilt for her with this bundle. the colors are great and good for a boy or a girl! Oh goodness, these fabrics are beautiful! After just inhaling their lusciousness and playing with them for awhile, I would make a few crazy quilted tote bags. I would use these cute fabrics in a lot of different projects. I think I would make something for our blue 1968 VW Bus! Maybe some curtains or seat cushions. Thanks for the chance! I would make a summer tote. Those prints would be perfect for purses and zip bags, I think. I love those prints so I would make an apron and some items for my daughters kitchen. She loves to do her cooking and those fun prints would be great for making stuff for her. I'd have to use that ukulele fabric to make a stuffed guinea pig. I'm making a small herd of them for the Fluff Project and a ukulele one would be too fun. so cute! I 'd make some lunch totes. Hmmm I think I would attempt to make myself some pajamas!!! I would make a baby quilt and use the leftovers for little pouches (no scrap goes unused around here). Ohhh...how cute! I think I would make a wall quilt and matching pillows! Thanks for the chance to win! I love this collection. Since I make mostly quilts, it would most likely become one. Maybe a baby quilt. Thanks for the chance! I think aprons. I have this desire to make some fun aprons for me and my daughters. And probably a dress and/or top for my little grand daughter. I'd make a baby quilt - the people I know are having babies at an astounding rate! I guess the possibilities are endless. I think I wold make a quilt. Something to show off the wonderful prints! That set of fabric is so cute. Probably a quilt for one of my local charities. I love working with fabric lines and using up some of my stash with it. I think it would be fun to make a quilt with all squares to show off the prints like RedPepper quilts makes. Definitely a QUILT. I'm a quilter after all. I fell in love with this collection when it was first introduced. I would definitely make a bag and have even looked at a few quilt patterns that I could use with this fabric. I would really like to have fun with this fabric. Thanks for the chance. I love this line! I would use this to make a quilt for my husband. What a pretty collection! I'd make a quilt with them if I were to win. Thanks for the chance to win! I caught a glimpse of your Supernova quilt, and I think that this fabric bundle would work for a quilt of that sort, with a lot of neutral color negative space. Thanks for the giveaway! So hard to decide, but I think a quilt would be wonderful! Thanks for the chance! the line looks so cute and kid friendly. i think i'd have to go with a baby quilt. I think a quilt, but a tote would be great too! Cute bundle! I'd use some for zipper pouches and the rest on a quilt. Thanks for the giveaway! They'd make a great looking set of cushions! That fabric looks really interesting and if the colors are what I really think they are, they'd match my kitchen colors. So, I'd make some things for the kitchen (such as mug rugs, coasters and placemats). Great fabrics - I'd make a quilt for my nephew who is getting married in June! I think I'd either make a quilt, or maybe some pillow covers. I'm sure it would take me forever to decide and cut into it :). Thanks for the chance to win! I think I would make a quilt! Thanks for the chance to win! I love all the fabrics! I would use them to make a quilt. I would make covers for the pillows on my family room sofa. That would really brighten the room! I'd definately make a quilt for one of the younger ladies in my family! So pretty! I love Fabricworm also, their custom bundles are so hard to resist. I would probably make a quilt and maybe a pillow from this fabric. Thanks for the chance to win! Ooo... Such fun prints. I think a tote bag or purse might be in order with these. Thanks for the chance to win! really fun prints, i'd probably make a boy quilt for my great nephews. I love this line. I would make dresses for my daughters. Maybe a zipper pouch or make up bag. It could also be a quilt for my son. Sooo many possibilities!!! Pillows would be great or an apron or lap quilt, thanks. I'm thinking a quilt or a shower curtain! LOVE the fabric! Thanks for the chance to win! HI,I THINK I'D LIKE TO MAKE ME AND MY DAUGHTER A NEW TOTE! THANKS FOR A NEAT GIVEAWAY! This year I want to try a scrappy triangle block quilt, so that's what I thought of when I saw this. love Fabric worm myself. A quilt for sure! I think these colors are great for a baby quilt and my friends are expecting... thanks for the chance! Great fabric and wonderful colors! I'd probably split them up and make several things... Pouches, a small quilt etc... I also love the triangles. Oh...it would be perfect for a summer skirt, or a maxi dress, or a swimsuit cover up, or a tote bag, or cute placemats!! I think it is begging to be a baby quilt! I think I'd make some pillows for my and my children's beds. Thanks! Looking at the stack of fabrics, I think it would make a great strip or chevron quilt for a crib or twin bed. Thanks for the giveaway! Gorgeous fabrics! I think I would make a skirt for my daughter because the fabrics are so fun and cheerful. I am really into bags these days, so probably a couple bags!! A weekender type bag. Thanks for the chance. 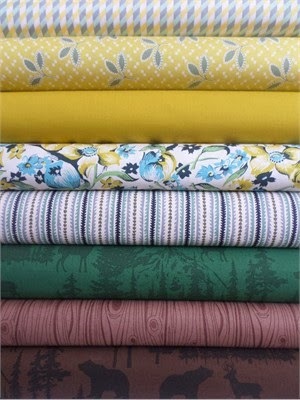 I love the Ipanema fabrics, but am unsure of what I would make. I like to touch and lay out the fabrics in different arrangements before I decide what to do with them. I have been wanting to make a couple of flight bags and this would be so sweet in them. Thanks for a chance to win. I would make a quilt- what gorgeous fabric!! I would make some pyjama pants out of the orange Bossa Ukes fabric. Those prints are adorable! I think they would deserve a nice new bag! I recently acquired a pattern book on making tote bags and purses and these fabrics look ideal for that. A quilt. I love the colors and prints! I love these prints! I would have to make something for my Dad since he builds guitars. Maybe bags or wall hanging. Thanks for sharing. The fabric is beautiful. A little more busy than I usually purchase, so it would make a great addition for a quilt stash. I love the blue guitars. I think this fabric would have to become my first paper pieced quilt of the year! So pretty! I would definitely make a quilt. I'm new to quilting, but I'm hooked! Those colors are addicting. I think I want to make a quilt and a pillow. I would definitely make some sort of quilt! I think it would make a gorgeous lap quilt. Thanks for this opportunity! I would make a tote bag & maybe some pillows. Thanks for the great giveaway & congrats on having FabricWorm as a sponsor, they're awesome! What a great collection! I would probably make an awesome quilt and some adorable pillows! Thanks! Gorgeous fabrics!! I only sew quilts so that's what I'd make! I'm thinking a picnic quilt and a bag to stow it in and keep in the car for trips to the park. Cute fabrics! I'd make a quilt! I'd probably make a quilt, bag and pillows. Thanks for the chance. I would make a quilt! I love this fabric! I have a wholecloth bed quilt that I dress up by changing out different bed runners. This would make a great one! Thanks for the giveaway! Probably a quilt - I don't think I need any more handmade bags at the moment. Thanks for the chance, this line is really cute! I would make a bag for my daughter to carry her music in. IT would be perfect. I would make some zipper pounches and reusable bags for my younger daughter. She would love these fabrics. I would make my first quilt. Totes, pillows, and zipper pouches oh my. I see endless possibilies with these super cute prints. I love fabric worm also they have some amazing organic prints at great prices. Thanks for the chance to win and congrats on them being your new sponsor. I think a quilt...but could also see some cute bags out of that adorable fabric! Thanks for a chance to win! Gosh, I see a cute apron and pillows for the couch. I think a quilt for a certain preteen I know would be a good use of this! I would make a super cute summer outfit for my 18 month old. Thanks! I would make some totes saving a few pieces for feature fabrics in a quilt block! Quilts most likely. I love quilts. I do want to branch out and try making a dress of two for my little girl, but need to teach myself to read a pattern first! btw thanks for the great giveaway! I think I'd have to make some bags - some for my boys, some for the girl and maybe a couple of the prints in a Weekender! Such cute fabric - I'd definitely make a baby quilt with this one. I've been making custom baby quilts for my niece and nephew, with their names on it. A quilt! (Of course!) Sashed squares, perhaps. I love Fabricworm too! I'd probably make a quilt, but it would be cute in a bag as well. I'd like to make a baby quilt with these fabrics! I am planing to make a quilt for baby boy. I think it is great color for him. I'd make some baby clothes with the fat quarters. Too cute! A bag! I love those colors. I would make a bag and maybe something cute for my daughter to wear. Thanks! I would make reversible pajama pants, toddler sized! How adorable are these prints?! Love it. Working on a quilt these fabrics would be perfect in! I´ll do a bag for me, and a dress for my baby! Something for my daughter to wear and a matching outfit for her Baby Molly! I would make a quilt, just for me. A lapsize throw to cozy up with on the sofa. Such gorgeous fabrics. Thanks for the chance to win. I wanna make that cute little dress for my daughter. I would make a great lap quilt for my husband's music studio. I would make a quilt and/or a bag...both of which are fave projects right now. Great giveaway, thank you!! Love these fabrics! 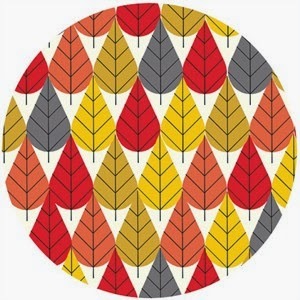 I would probably make a quilt, and the yellow triangles would be perfect for a skirt! I would definitely use the fabric to make a quilt. Thanks for the opportunity! Love the photo of the dress! Maybe make that for my daughter, although the guitar motif fabric reminds me of my niece, so maybe something for her! I would love to try my hand at an Airplane cargo bag and maybe some aprons for the kids! Loving this new line! I would probably make a purse with matching makeup pouch! Adorable! These colors and prints are fabulous! I have a new grandson coming in May, and a quilt for the nursery would be awesome! Swoooooon! Definitely a quilt, but those yellow triangles would make great napkins in my house.